Last week Quince & Co. released Scarves, etc 5, their annual collection of scarves, cowls, shawls, etc made with a full variety of Quince & Co yarns. 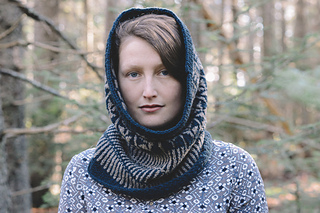 My favorites this year are the colorwork cowl, Flying Geese by Peg Blechman and the light and lovely Paperless stole by Leslie Anne Robinson. I often choose one neutral color when I make a two-color piece like Flying Geese. (In fact, the colors used for the design sample remind me of one of my own colorwork design projects.) Two colors, two colorwork patterns, deep and snuggly, in the warm heathery alpaca/wool blend that is Owl, what's not to love? My favoriting the Paperless stole took me by surprise... What I really appreciate, in addition to my love for the light & beautiful mohair/merino yarn, Piper, is the variation in stitch pattern on the side and bottom edgings. I have often used such a distinct edging (as in my Love and Prayers Scarf). But a stole? I have never worn a stole. And yet if you look at the photos, you might find yourself wanting one, as I do. True disclosure: I submitted a design proposal for Scarves etc 5 made with two colors of Piper yarn. It was for a smallish scarf. I believe that there were some good ideas in my proposal. But, truth be told, before I sent it in, I did not have a lot of time to consider the 4 edges. I mean, I did show or suggest what the edges would be, but Paperless did it so much better. Since the day that I first learned that my own design submission for Scarves, etc 5 had been rejected, I was very much thinking about making a much larger rectangular shawl (a stole?) with the same yarn and with a more distinct bottom and top edge. Now I can see a stole as being something that I could actually wear and I am inspired. I recommend viewing the gorgeous Scarves, etc 5 Lookbook (find link on this page). For this one, Quince includes designer descriptions and inspirations. (Interesting that Paperless was inspired by an embossed paper towel.) The ten patterns in the collection are available at Quince & Co for $5.50 individually, or just $19.00 for the collection. And now the News on an Old One: The patterns in the first Scarves etc, now named Scarves etc, 2012, have just been collected into a bundle. Formerly these patterns were available only individually for $5.00 each. Now you can purchase all twelve for just $22.00. The Scarves, etc 2012 Lookbook is also quite beautiful and worth a few minutes of your time (find link on this page). I am still rather proud to have a pattern in that collection. 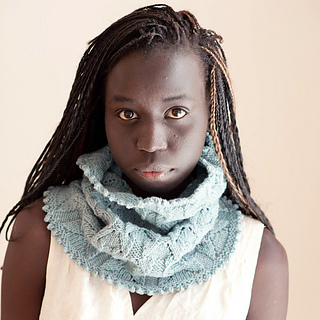 Scarves, etc 2012, © Quince & Co.
Jonna is now available as part of the Scarves etc 2012 bundle.